I am still having so much fun with swag bucks! If you've already joined and you're having trouble remembering to search or if you're still on the fence, I have some news for you! First of all, if you've joined and you find yourself forgetting to search, here area a couple things you can do. First of all, make sure you've downloaded the toolbar (log in, and click the "Toolbar" tab at the top) so it's there where you can see it. Now, here is the tip that has helped me SO much. While it may be a pain to remember to search, think of what you already do on line. Do you check your email? Do you Facebook? Do you have blogs you like to read (wink, wink)? Well, search for those! For example, enter your email website into the Swag Bucks search box. Once the results pop up, bookmark that results page (renaming it "email"). Now, when you want to check your email, go to your bookmark, click on it and up will pop the results page. It will count as a Swag Bucks search and you're on your way to checking your email. It adds one extra click, but will help you win more swag bucks. I do this with my facebook account, my blog, my email, my Netflix account, my local weather webpage, etc. I win this way regularly and I'm searching while checking the sites I usually check anyway! 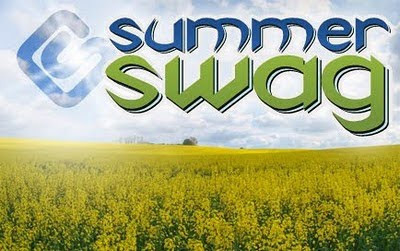 First of all, if you sign up before June 11th and then use this code "SUMMEROFSWAG" (Enter the letters between the quotation marks in the field "Enter your Swag Code" once you're logged in to your Swag Bucks homepage and hit the "Gimme" button) you'll get an additional 20 Swag Bucks (you get 30 automatically for signing up, so this makes it 50!). The code will only work until midnight on June 11th (PST). "Yesterday I told you Monday was going to be a big day for Swag Codes, and it is - AT LEAST 5 different codes will be coming your way on Monday! That's not even the best part, though. The best part is why we're having a big code day. It's the kickoff to our Summer of Swag! We've got some really big stuff that will be debuting this summer - things you've been asking for - and TSG can't WAIT to share them with you. It's definitely going to be a summer to remember at Swagbucks. In the meantime, this coming week is going to be a BIG one too. In addition to going code crazy on Monday we'll be highlighting a different bill every day - BIG bills, too. As an added bonus, every day the featured bill will be awarded to every 7th win on Swagbucks! On Monday, that bill will be the 25 Swag Buck bill." So, now really IS the time to sign up and search. If you're ready, go here! If you want more info., click on my "Swag Bucks" page just under the header picture up at the top of my blog. progress! Thanks for telling about this.